Salem • View topic - I DID IT! Last edited by Dallane on Sat Feb 28, 2015 7:40 pm, edited 13 times in total. <milonti> Psshh, tears are tier 5 products. I had no clue I had passed 1k too. This is now the 1000+ post club members-only area. Good, now maybe you'll quit spamming everything up. Congratulations, you are now a recognised forum spammer. I took like a 3 week break and I'm still the highest count I've seen. Sevenless wrote: I took like a 3 week break and I'm still the highest count I've seen. I will neber stop the spam! 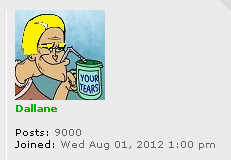 Seeing as there is a total of ~22000 posts on the entire forum, the four of you in the 1000 post club account for roughly ~20% of all posts. That's both amazing and sad, like a fireworks show exploding and killing five people.